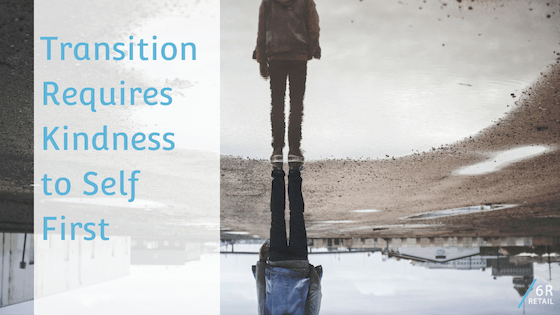 Transition projects and role transition both require kindness to self first. When in transition, there are 5 pointers to look out for and to help manage the transition process. From Doing to Managing: Mentoring Through the Transition Career transitions often mimic corporate change. We don’t always know what lies ahead in the future, and that can be scary. Also, we need to time to navigate these uncharted waters, so we can settle into a new phase, whether as an employee moving up to managing or as a work team opening another channel or bringing a new product to market. Mentoring employees who are going from “doing” jobs to management requires finesse and most of all, kindness. Let’s take a look at how to make the process as painless and successful as possible, including how to encourage a culture of kindness. Clear Is Kind Have you ever avoided a difficult conversation or assessment because you felt it was unkind? We’re not talking about telling a friend her new frock is less than flattering but the kind of situation where a work colleague or direct report needs honesty, and you’re avoiding it. Whilst you may feel like you’re doing the other person a favour, in the long run, you’re not. According to research professor and champion of courage in leadership Brené Brown, being clear is the kinder option, even if it’s harder in the short term. “Unclear is unkind,” she says, and can foster undesirable behaviours in the workplace, such as back channelling, passive-aggressive actions, and decreased performance. Encourage Feedback To help with those challenging conversations, encourage your mentee to solicit frank feedback from various corporate tiers, especially as they work through the transition period. This can help to prevent them from being blindsided by opinions that may disagree with their own and to recognise when they have made mistakes. Encouraging feedback will also engender self-determination in the people reporting to the new manager. It sends a message to employees that their thoughts are valued and appreciated, which further supports intrinsic motivation, improved productivity, and even worker retention. Help your mentee develop a plan to address feedback, so they feel proactive rather than pinned down by it. Guard Against Burnout When moving up the ranks into management, employees may be particularly susceptible to burnout. There’s a temptation to feel they need to work longer and harder, in case they miss something. And of course, there may be new tasks or software programs to learn, and some work environments expect managers to handle those on top of their day-to-day duties. If you’re mentoring new managers, encourage them to constantly assess where they can best spend their time. Often, they are still doing things they could be delegating; delegating is one of the hardest things new managers may have to learn. Also, remind them to eat at regular times, not to stay at the office late into the night, and to use weekends to recharge for the coming week. This is good advice for mentors as well! Support a Kindness Contagion Fostering a culture of kindness in the workplace can help with all of the above. Although that may seem a gargantuan task in some organisations, due to size or existing zeitgeist, it is possible. Mercedes-Benz USA decided to do that, originally as a customer service initiative, but it trickled down beautifully to its employees as well, who were given opportunities to drive a Mercedes vehicle for 48 hours at a time of their choice, such as an important occasion. Then, when these employees experienced kindness in the work environment, they reflected it back to their customers. The human brain is much more connected to the heart than many people believe, as a result of our ancestors’ fight-or-flight mechanisms. Furthermore, we now know the brain possesses the neuroplasticity to change, to rewire itself and create new connections. A workplace that is committed to kindness can create change and watch it take off in a kind of viral contagion that benefits employees at every level. As a mentor, you may not be in a position to affect company-wide change at first, but you can still remind your mentees that kindness will help them when they practice it. Eventually, if enough members of any organisation engage in kind behaviours, the company can’t help but see the change their employees want and are willing to demonstrate themselves.